Misr International University constantly strives to provide students and graduates with quality education, mentoring and access to extensive knowledge to help them lay the first stone in their promising future. 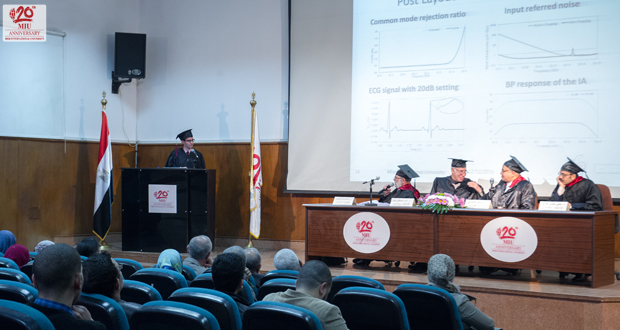 MIU’s first Master’s Thesis Defence of Engineer Mohamed Abdel Raouf entitled “Design & Implementation of ECG Read-out Circuit Based on Advanced CMOS Operational Floating Current Conveyor” was held on Thursday, December 22, 2016 in OOA Hall. The defence was attended by 45 of Eng. 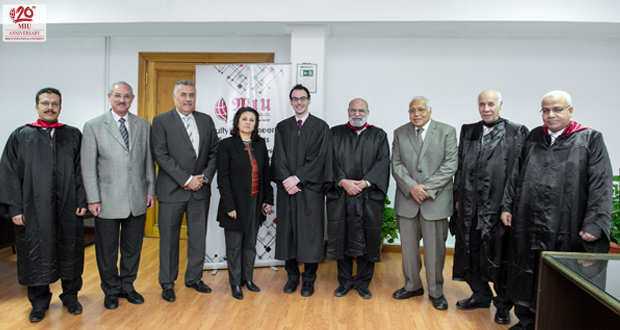 Abdel Raouf’s family members, faculty deans, faculty members and senior students. Engineer Mohamed Abdel Raouf graduated from Misr International University and currently works as a Teaching Assistant in the Department of Electronics & Communication Engineering, Faculty of Engineering Sciences & Arts at MIU. 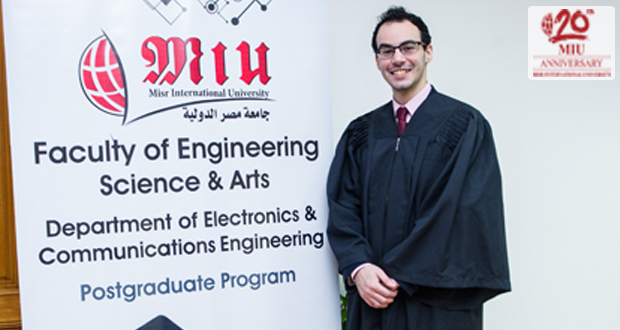 He is the first holder of Master of Science in Electronics & Communication granted by Misr International University. 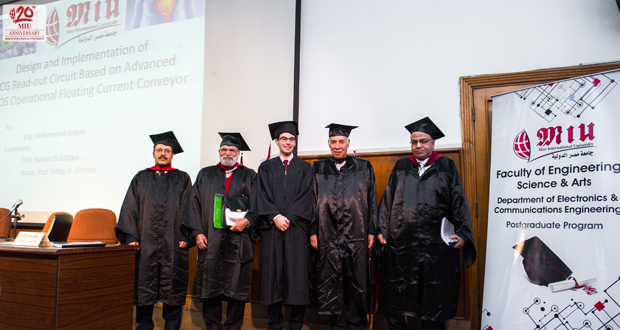 The jury members were: Prof. Dr. Hassan Ahmed El Ghitani, the Dean of the Faculty of Engineering Sciences & Arts – Prof. Dr. Alsayed Saad, Faculty of Engineering, Helwan University – Prof. Dr. Abdelhalim Zekri, Faculty of Engineering, Ain Shams University and Dr. Yehia Ghallab, Faculty of Engineering, Helwan University.